The easiest way to bring life into your workspace is with the right window treatments. 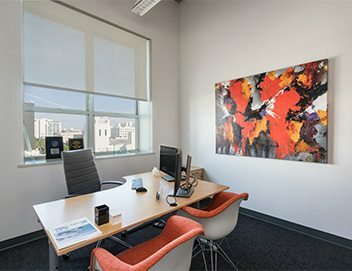 Imagine an office beaming with natural light that brightens even the dullest of corners, yet with the touch of button, the space can be dimmed to provide privacy, temperature or glare control. Or envision yourself holding meeting in the conference room, and for the first time ever, no one is distracted by the sounds that occur outside your window or the glare on your presentation screen! With our wide variety of products and extensive experience, our corporate team strives to turn these visions into reality. Cost & Energy Efficiency: The cost of running a business is not cheap. With temperature and glare control products, companies are able save money on their energy bills. Time Efficiency: With treatments that are easy to maintain, clean, and operate, you get to spend more time on what really matters; running a successful business. Noise Reduction: Most corporate spaces are in urban locations. Consequently, the beautiful city life is almost t always accompanied with noise. Noise is not just an outdoor issue, as it can occur inside if your office is located in a large and heavily populated building. Treatments that drown out sound allow you to focus on your tasks at hand and meet your deadlines. At Shades By Design, we understand that no two buildings are the same, and with that in mind, our aim is to contribute to each client’s unique and personal needs. Whether your space has an abundance of windows or just a few; Whether you are furnishing an entire office building, retail space, or private suite, there is a solution for you! Don’t forget to ask us about our full office building automation solutions!